When a U.S. president leaves office, the Smithsonian partners with the White House to commission an official portrait to be displayed in the National Portrait Gallery in Washington, DC. 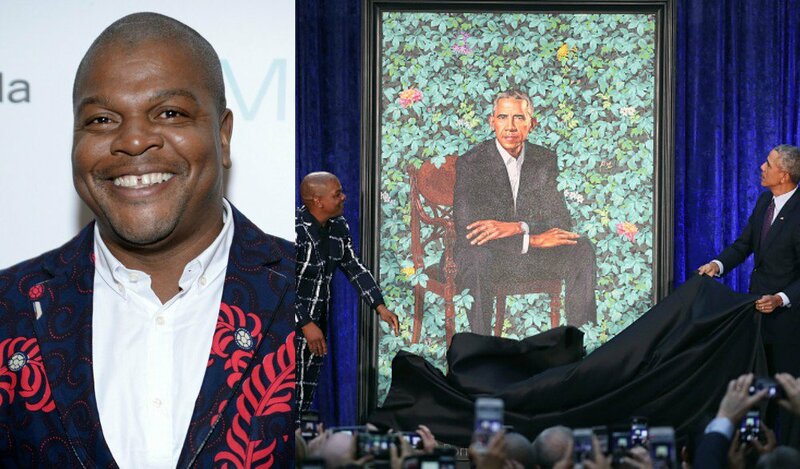 This past October, former President Barack Obama selected New York City-based artist Kehinde Wiley to complete this task. Wiley—known for his highly naturalistic paintings that often take a twist on European classical style—was a bold choice, not only becoming the first Black artist to paint a president’s portrait, but also the first queer artist to do so. When the news of Wiley’s commissioning for the piece was initially reported, mainstream media did a fair job of acknowledging the importance of his identity as a gay man, something Wiley has been very vocal about. However, following the portrait’s unveiling many headline stories opted to omit Wiley’s sexuality, an erasure seen too often for Black queer men shaping culture. Didn't know about this guy, my ignorance being in tune with your reason for posting. Now that I do know can't help wondering if being aware of his sexuality has given rise to this crazy accusation that the portrait contains depiction of sperm. There are so many wacko notions around regarding anything gay that I shouldn't be at all surprised if it is indeed the case - those nutcases needing insane ideas like that to feed and keep alive their delusions.